Devin Coldewey for TechCrunch: Everyone knows the robots are coming, so we should probably get to work figuring out how we can coexist. That’s the mission of Veo Robotics, which is working on a system that gives robots spatial awareness of every object and obstacle in their reach, from debris to people and everything in between. People and robots working together can accomplish far more than either one on its own. There’s a growing demand for collaborative robots, explained Veo’s founder, Patrick Sobalvarro. These smaller robots with extra safety mechanisms and user-friendly configuration features have been popular with small businesses, but they’re quite slow and weak compared with those used in heavy industry. Yet thoseare dumb and hence dangerous enough to require their own cages and work spaces. How do you get the best of both worlds? 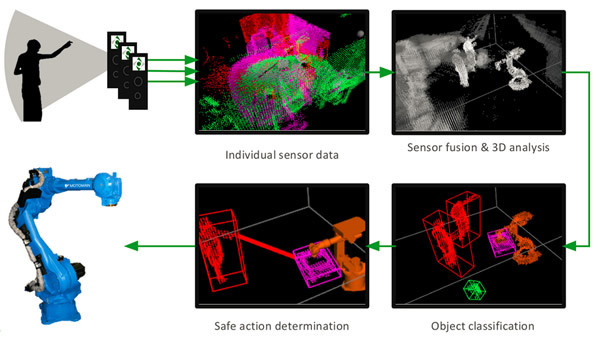 Fraunhofer researchers created something along these lines, but Veo’s approach seems more dynamic and responsive, relying not on safe and unsafe zones but doing object recognition and other semantic modeling.